Retreat in our “learn-by-doing” format—we focus on personal growth, healthy food, and tools for wellness. You will come away with a number of “light bulb moments” that can help alter your perspective and move you forward through your turning point to achieving your goals. Ultimately you will gain tools for thinking, feeling, and living a healthier, happier life. Learn about healing with a variety of wellness tools, such as: herbs, Ayurveda, acupuncture, sound healing, aromatherapy, energy work, yoga, hiking, and swimming. Develop a daily mindfulness and meditation practice. Learn how to calmly respond rather than react. Some of the benefits of mindfulness and meditation are: reduces stress, helps you know yourself better, improves comprehension, lowers depression, improves emotional processing, and improves sleep. Dinner Around the Farmer’s Table – Vermont Cuisine Shines! An amazing evening with a 4-course meal crafted by our culinary team led by Chef Charlie Menard to showcase the very best cuisine of the Mad River Valley. You can also join us for the entire weekend of relaxation, inspiration, preparation and confirmation for your upcoming wedding weekend with us. Spend a nice weekend in our comfortable Vermont B&B rooms, complete with a beautifully prepared breakfast daily. 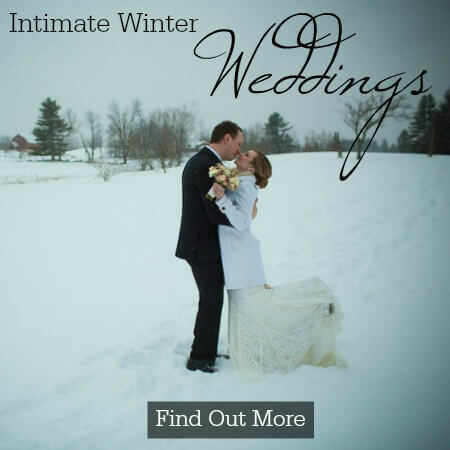 Sample some of our hors d’oeuvres at the Inn during our welcome reception, have a Saturday night candlelit dinner, an hour of planning time with our event coordinator on your upcoming Vermont wedding and a chance to also unwind…with each other. This is by far the most popular weekend we have for our prospective couples before your upcoming wedding at the Round Barn Farm. If you have been married at the Round Barn this is also a great weekend to come back for a visit and share your wisdom with newly engaged couples. Posted in | Comments Off on Dinner Around the Farmer’s Table – Vermont Cuisine Shines!